Product Details - Material- Tough Natural Rubber, Use-This toy will give your dog mental stimulation and maintain oral hygiene of your dog, Pet should be supervised while playing the toy, Suitable- Small Dogs and Puppies. Dimensions -5 cm. 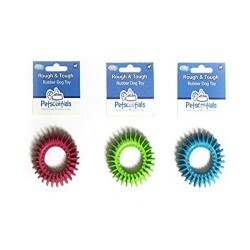 Product Information - This toy will give your dog mental stimulation and maintain oral hygiene of your dog, This toy is made from tough natural rubber. The toy is resilient and very durable, The toy is resilient and very durable, Pet should be supervised while playing the toy, Suited for Small Dogs and Puppies.